Every soon to be bride wishes to look her best on her wedding day and women take all sorts of fashion measures to achieve this goal. Indian brides on the other hand; have so much to work with when it comes to bridal wear including but not limited to bridal jewellery. It is quite common for most Indian brides to take the traditional route and opt for exquisite traditional bridal jewellery on their wedding day but many brides do opt for a different look which often involves mixing and matching bridal jewellery pieces for a traditional yet trendy outcome. This blog aims to present effective suggestions for soon to be brides looking for tips on how to effectively mix and match different pieces of contemporary and traditional jewellery. Read further to know more. When it comes to fashion; the best way to make an effective presentation is with pictures that drive home the point being made and this blog aims to do just that. Scroll down for stunning pictures that are suggestive of ways to mix and match bridal jewellery for a look that is both traditional and trendy. Corresponding information with all pictures will serve as added guidance. Read further to know more. One way to go against the grain and achieve a bridal look that is both traditional and trendy is to opt for statement piece bridal jewellery. By definition; a statement piece bridal jewellery item is the “piece de resistance” that the rest of your bridal jewellery merely compliments. Technically; “less is more” is a fashion fundamental that has been an essential truth for a while now and statement piece bridal jewellery can help carry off the “less is more” bridal look. 1. An antique brooch like mang tikka with a brilliant and precious gemstone is yet another way for modern-minded soon to brides to carry off a bridal look that is both trendy and traditional. The trick here is to go minimal in terms of other jewellery and let your mang tikka steal the limelight for you. 2. This is yet another approach to letting the “less is more fashion” fundamental work for you. While the matha Matha Patti is indicative of the statement piece; it is easy to see how almost no other bridal jewellery pieces are needed to complete this bridal look. It is easy to see how the bridal jewellery ideas above help you to achieve more with fewer pieces of cumbersome bridal jewellery. These ideas are sure to appeal to trendy soon to brides who wish to incorporate traditional elements into their bridal look without going overboard. The idea here is to look the part of a millennial bride who appreciates the aesthetic and trend value of traditional Indian jewellery. Piling on bridal jewellery is definitely a thing of the past for modern Indian brides. Colour blocking with an emphasis on trendy pop colours is another way to mix tradition with trends. While you may choose to incorporate the colour blocking trend into your bridal ensemble with your bridal garments; there is scope to do the same with trendy jewellery. 3. Make note of how these colourful bangles can add a fun and festive feel to your bridal trousseau. This brilliant idea wherein you can use widely available glass bangles for a colour blocking effect makes for a trendy addition to your traditional ensemble for your sangeet ceremony. Gold jewellery is the overwhelmingly common bridal jewellery of choice for most Indian brides but if you are on a quest for traditional yet trendy bridal jewellery and you are looking to mix and match your accessories accordingly; you need to think beyond gold. One way to do that is to consider the resplendent appeal of diamonds and platinum. The combination of diamonds with platinum makes for elegant bridal jewellery and when you stick to diamond and platinum jewellery pieces made with an emphasis on traditional designs; you have it all; trend and tradition. You may also like: Why TBG South Indian Bridal Jewellery Set Rentals are Popular? 4. This resplendent diamond studded bridal jewellery combination of jhumkis, Matha Patti and bangles is an excellent idea for bridal jewellery mixing and matching that is both traditional and trendy. When combined with appropriate bridal attire; this is one definitive way to look the part of the trendy Indian bride. 5. Mixing and matching trendy and traditional jewellery can work for the contemporary South Indian bride too and the picture above bears ample evidence. Make note of how this beautiful splendid bride is bedecked in traditional jewellery from head to waist; traditional jewellery like kamarbandh and bajuband among others with a conspicuously contemporary and trendy design concept. 6. A stunning diamond choker necklace is one way to go beyond gold and incorporate current trends into your traditional bridal ensemble. A diamond studded choker like the one above will also effectively serve as the piece de resistance of your bridal look. 7. This is yet another look to add to your bridal fashion goals if your agenda for the day is to mix and match traditional and trendy bridal jewellery. The bridal tiara is a rather new concept for Indian brides however when worn right; it is a stunning and trendy bridal accessory that can be mixed and matched with traditional bridal jewellery pieces. Make note that the best tiaras are platinum studded with diamonds or other precious and semi-precious stones. From the examples above it is easy to see how going beyond gold and thinking out of the box can help you achieve the perfect traditional yet trendy Indian bridal look. When trying to incorporate both trendy and traditional elements into your bridal look; consider fusion bridal jewellery. Fusion bridal jewellery is easily available and is the go-to option for many soon to be brides. 8. 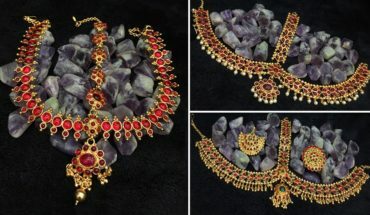 This necklace and earring set is an excellent example of fusion bridal jewellery and you can go one step further by pairing it up with a traditional mang tikka or matha Patti on your wedding day. 9. Here is yet another example of fusion jewellery studded with diamonds and centrepiece emeralds that will make for great bridal fashion. Once again; bring in the traditional by mixing and matching other jewellery pieces with a conspicuous traditional design element. 10. Fusion jewellery often incorporates design elements from around the world and the bridal necklace and earring combination shown above does just that. Studded with semi-precious stones and African glass beads; this could easily be the piece de resistance of your bridal look. Fusion jewellery works best for Indian bridal ensembles when effectively paired with traditional bridal jewellery pieces. It is a sure shot way to add some trendy variation to your traditional bridal look. In conclusion; all of the pictures above make a good case for upping the ante by incorporating trendy elements with your traditional bridal look. This is the goal for most Indian brides of this day and age and this blog is replete with suggestive ideas on how to achieve this goal. The reader can either benefit from replicating the looks detailed above or being inspired to try something new. One way or the other; this blog sets the tone for mixing and matching bridal jewellery to arrive at the perfect traditional yet trendy bridal look.